Free Shipping All the Time! Frameless tub screens are simple, beautiful glass panels separating the bathing area from the rest of the bathroom. A custom frameless glass screen can be fabricated for any size and style preference, creating the perfect compliment to your bathtub. Not sure how to start? 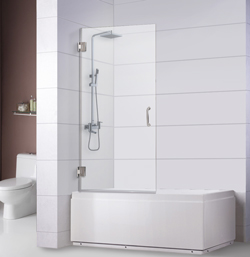 Get detailed instructions with our Bathtub Door Installation Guide. Choose a rounded corner finish for a seamless look; a perfect way to match other curved bathroom décor like mirrors and circle corner shelves. Choose a square corner finish for a sleek and stylish look; an easy way to match your mirror and shelf corners' angled design hues. 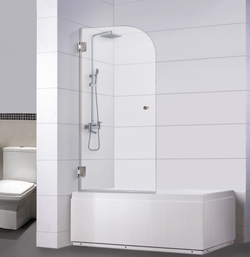 Glass Screen Width: The most common width for bathtub screens is 30" wide. We are also able to fabricate custom bathtub screens in additional sizes from: 24" to 34" wide, to fit the width of your bathtub space. 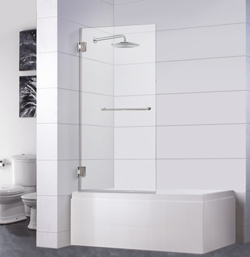 Glass Screen Height: The most common height for bathtub screens is 60" tall. We are able to also fabricate custom bathtub screens in the additional sizes of 58" to 70" tall, to perfectly fit the height of your bathtub space. Bathtub Screen Glass Types: Glass types for your bathtub screens include: Clear Glass, HDglass, Frosted, Gray and Bronze glass. 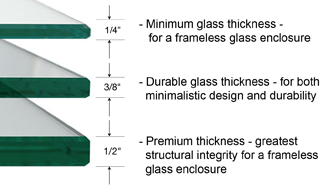 All glass types tempered for your safety. 1/4" Thick Glass is the thinnest glass option, for a frameless design with the greatest light transmission. 3/8" Thick Glass is the most popular option. This medium glass thickness provides both sturdiness and minimalist design. 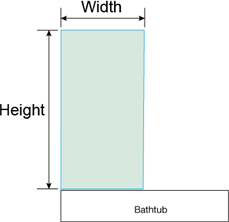 1/2" Thick Glass is the premium glass thickness option used in glass bathtub screens. Thicker glass feels and looks more substantial in this option. Bathtub Screen Hardware Finishes: You can stylize and decorate your bathtub screen with a wide variety of hardware finishes. Including: Chrome, Brushed Nickel and Oil-Rubbed Bronze. 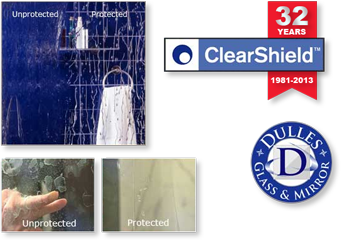 ClearShield Glass Protection for Bathtub Screens: For added hygiene and longevity of your bathtub screen, select the ClearShield glass protectant option for a superb, “hyrdo-phobic" glass, where the water beads off, and keeps your screen perfectly clear for years to come. 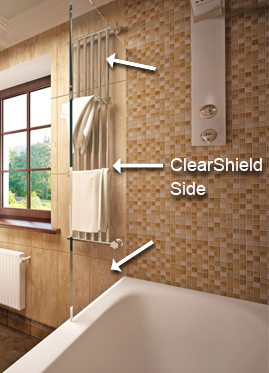 With the ClearShield System, say goodbye to stains, dirt, discoloration, and hard-water stains, and say hello to an easy-to-clean bathtub screen. Bathtub Screen Side Selection: Please select a Left or Right Side Bathtub Screen. I.e. which side of your bathtub the screen will be installed. This is dependent on the current configuration of your bath/shower fixtures. For a beautiful corner option, get your Bathtub Screen with a square corner finish. These crisp corners, show off the sleekness of the glass. Rounded Corners are also known as radius corners. These rounded corners add a curved design cue to your bathtub screen glass. 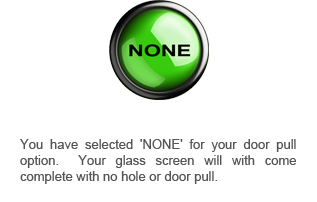 Screen Side becomes important in instances when the glass has two different characteristic -- i.e. ClearShield coating, or Rain Glass Texture on one side. Since only one side is treated or textured, the glass screen is only appropriate for either a left side or right side installation. 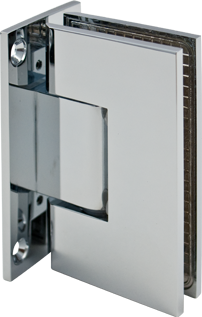 The hinge side is always on the side of the showerhead/fixtures. Height: It is recommended that the height of your bathtub screen be level (same height) to your showerhead. 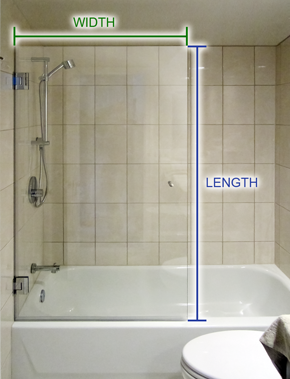 Additionally, another way to measure the height of your bathtub screen, is to step into your bathtub and measure how tall the screen will have to be, to be at your own standing height. Ships in 1-3 business days. Are these bathtub screens FIXED or SWINGABLE? These screens are not fixed, and are in fact swingable – they swing outwards from the bathtub. What height and width should I order my tub screen? Have the height of your bathtub screen be at the same height of your shower head, or step into your bathtub and measure how tall the screen would have to be, to be at your own height. The width of the screen should be 1/2" the measurement of your whole tub. Can you install the tub screen without studs? It is possible with the right anchors but it is NOT recommended. A glass tub screen is very sturdy hardware that lasts for years and years to come. And the best way to make sure that that sturdiness is maintained, is by installing it on studs. How long will installation take and how many people are required? It may take around 1.5 hours for the installation of your bathtub screen. And it's recommended to have two people installing the bathtub screen, and handling the glass. What is the difference between a left side and right side glass screen? There is no inherent difference aside from one being left sided, and one being right sided, as bathtub screens are not universally "sided." 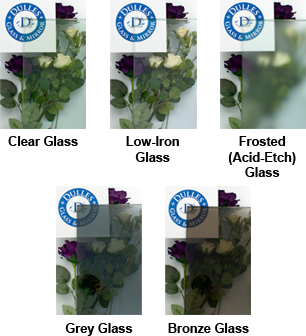 This is key, in instances where one side is rain glass and the other side is regular glass, or one side is treated with ClearShield and the other side is untreated. 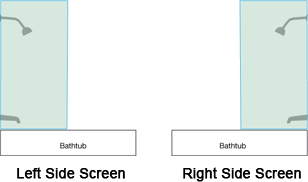 The glass screen can only be installed on one side of the bathtub – the side where your bathtub fixtures are installed. When designing your bathtub screen, choose the screen that is for your bathtub space, and order the height and width that fits your space. What is the warranty with my bathtub screen purchase? All hardware fixtures that come with your bathtub screen are protected by a 1-year replacement warranty. The max DGM is responsible for is the cost of replacing the product. © 2019 Dulles Glass and Mirror. All rights reserved.